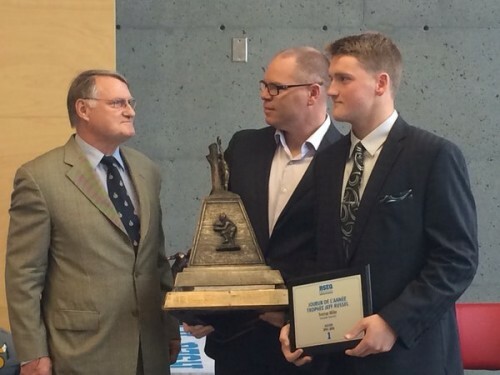 Montréal, November 13 2015 – The RSEQ (Réseau du Sport Étudiant du Québec) was pleased to announce the 2015 RSEQ University Football major award winners during a press conference held today at Université Laval, host of the 2015 Dunsmore Cup. Trenton Miller and Yanic Lessard of the Concordia Stingers, Jeremi Roch and Justin Roy from the Sherbrooke Vert & Or, Jonathan Boissonneault-Glaou of the Montreal Carabins, Charles Vaillancourt, Mathieu Betts and Antony Dufour and coach Glen Constantin of the Laval Rouge et Or were honored. 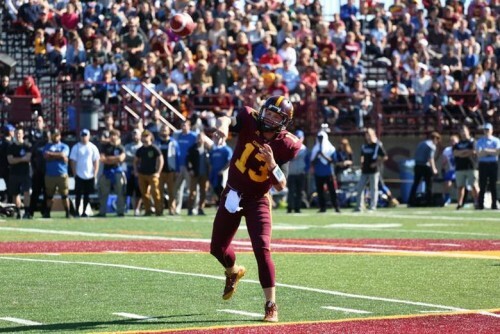 Nominated for the Hec Crighton Trophy, Concordia Stingers quarterbackTrenton Miller captured the Jeff Russel Trophy awarded annually to the RSEQ Most Valuable Player. A native of Buffalo, N.Y. who joined the Concordia Stingers this season, quarterback Trenton Miller participated in all eight regular season games but only started in the final six games. He completed 204 of 309 passes (66.0%) for 2384 yards and 20 touchdowns. He threw just eight interceptions. Miller led the RSEQ conference in four statistical categories – passing attempts, completions, yards and touchdowns. He set Concordia University records for most completions and touchdowns thrown in a single season. The 21-year-old MBA student took four graduate school classes while competing with the Stingers this season. Quarterback Jérémi Roch of the Sherbrooke Vert & Or is the 2015 RSEQ Leadership and social engagement award award recipient and will be the conference nominee for the prestigious Russ Jackson Award. 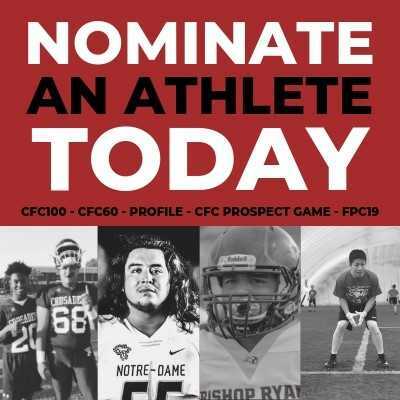 Named after CFL quarterback Russ Jackson, this award recognizes a Canadian university football player who excels on the field, in academics and in community service. 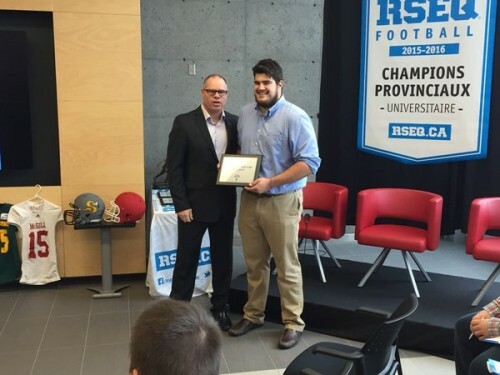 In addition to setting many new career marks (4 team, 4 RSEQ and 3 CIS) in 2015, Roch proved to be not only an exceptional quarterback but also a brilliant student in the graduate administration program and a young man involved in his community, volunteering his time to an array of causes and organizations. 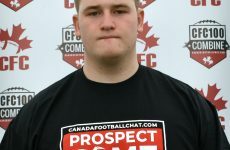 Despite the high demands of his athletic endeavors, Jérémi remained an excellent student in a tough and competitive curriculum and maintained the same high standards he had for football. 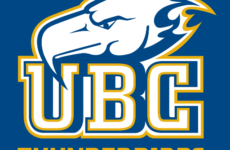 He assumed teaching assistant duties at the Faculty of Administration in the fall of 2015 and a is a research assistant for projects in the marketing department and the department of Information and Management Sciences systems. He is the recipient of an institutional scholarship for research in the graduate program in administration. Jérémi never missed a game during his five years at Sherbrooke playing through numerous injuries. A feat in a physically demanding sport such as football. He was a member of the Vert & Or Student -Athletes’ Committee for 5 years where he played a very active role. He will act, in the coming weeks, as the regional spokesperson for Operation Red Nose Sherbrooke. For a second year in a row, he’ll set up and coordinate a team of twenty volunteers for the benefit of the Breakfast Club which serves snacks and breakfasts to schoolchildren from disadvantaged communities. Last year, the University and its Student Life Services awarded him the Constance Award for his leadership and sustained commitment to the community. The Vert & Or’s No. 12 is very generous of his time and makes himself available whenever needed to both media and organizations. He regularly acts as the spokesperson for the Sherbrooke’s student-athletes on numerous occasions. He was very active this fall in the Vert & Or’s student-athletes t-shirt sale to raise funds for the Canadian Cancer Society in the fight against breast cancer. Nominated for the Presidents’ Trophy, Université de Montréal’s defensive lineman Jonathan Boissonneault-Glaou has been named the RSEQ outstanding defensive player of the year for his outstanding play in 2015. Boissonneault-Glaou stood out namely for its versatility on the Carabins’ defense this season. The second-year defensive end distinguished himself by his total of seven tackles behind the line of scrimmage for combined losses of 35 yards. Of these, he sacked the opposing quarterback on five occasions. In eight outings, he managed a total of 26 tackles, including 21 solo. The 22-year-old has also been an effective pass defender, managing an interception and batting down four passes. He also forced a fumble. Boissonneault-Glaou is the third consecutive Carabin to win this award. Nominated for the J.P. Metras Trophy, the RSEQ outstanding lineman of the year is guard Charles Vaillancourt of the Laval Rouge et Or. Vaillancourt needs no further introduction. A unanimous choice on the RSEQ All-Star team during his four seasons with the Rouge et Or, the 6’4 ” and 315-pound guard was also selected to the first CIS squad in 2013 and 2014 on the second team in 2012, his rookie year. 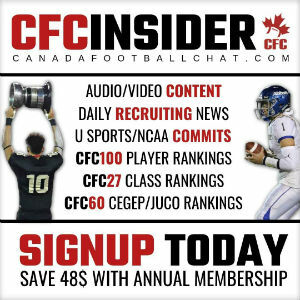 Ranked the tenth best eligible prospect by the Canadian Football League Scouting Bureau for the 2016 CFL Canadian Draft, Vaillancourt has once again contributed greatly to the success to a Laval offense who scored on average 37.3 points per game this season, the highest total in the RSEQ and the sixth highest in the country. Laval also ran for an average of 211 yards per game, first in the RSEQ and fourth in Canada. 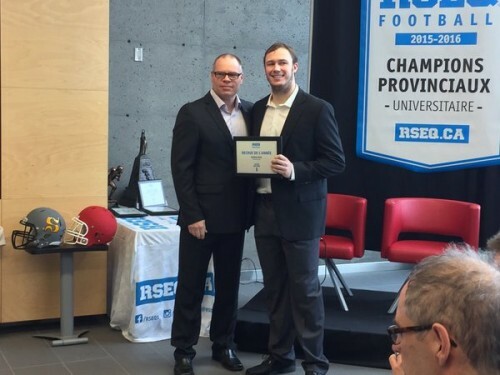 Nominated for the Peter Gorman Trophy, the RSEQ Rookie of the year is Laval’s defensive lineman Mathieu Betts. Expectations were high, but the least we can say is that Matthew Betts delivered. A starter in each of the Rouge et Or eight regular season games, the first year defensive end terrorized opposing quarterbacks throughout the 2015 campaign.The Montreal native accumulated an impressive total of 12 sacks this season, only one-half short of the Canadian record. Those 12 sacks on the opposing pivot still represent a new national mark for a rookie and equals the record set in 2014. Betts completed the 2015 campaign with 24 tackles, including 19 solo, three fumbles, three knockdowns and one fumble recovery. Concordia Stinger wide receiver Yanic Lessard was the top rookie receiver in the CIS in 2015 and the top receiver in the RSEQ. The Ste. Julie, Que. native led the RSEQ in several statistical categories including receiving touchdowns with eight, average receiving yards per game with 91.0 and total receiving yards on the season with 728. The graduate of the Champlain College Lennoxville football program was named the RSEQ Offensive Player of the Week on Oct. 26 after he caught nine passes for 144 yards and a touchdown versus the McGill Redmen. He is a first-year Economics student. Defensive back Justin Roy of the Sherbrooke Vert & Or, University exceeded expectations by playing a crucial role in his team’s defensive backfield and was named Defensive Rookie of the Year. 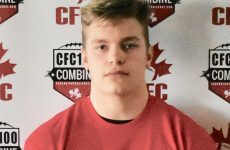 The former Cégep de Sherbrooke and Law student-athlete had a very good first season intercepting the opposing quarterbacks on three occasions in eight games. He also batted down two passes and recorded 16 solo and 5.5 assisted tackles for a total of 21.5 tackles including one for loss. The gifted Roy quickly gained the confidence of his coaches to make him a starter on the Vert & Or’s secondary. In his third campaign for the Laval Rouge et Or, Anthony Dufour proved his worth and is the RSEQ outstanding Special Teams Player for 2015. The receiver and return specialist averaged 134.9 combined yards per game, the highest in the RSEQ. He returned three kicks for touchdowns, not only in the best total in the RSEQ but in the country also. His average of 13 yards per punt return ranks him second in the conference while his 21.4 yard average on kickoff returns grant him the third spot in the conference. 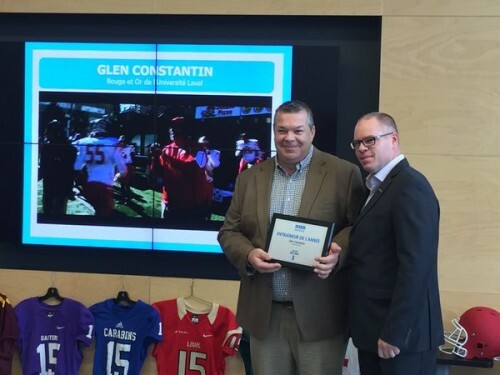 Nominated for the Frank Tindall Trophy, Laval head coach Glen Constantin has been chosen as the 2015 RSEQ coach of the year. Constantin led his team to an 11th consecutive regular season title in 2015 in addition to leading his troops to a 13th consecutive appearance in RSEQ Dunsmore Cup. This is the third time in Constantin’s career as the Rouge et Or’s head coach that he has earned the honor. He was also named RSEQ coach of the year in 2008, 2009, 2010 and 2012. In 2005 and 2010, he received the Frank Tindall Trophy, honoring the coach of the year on the national scene.Hired as defensive coordinator for the Rouge et Or in 1996, Constantin took the helm of the team in December 2000. Since then he has had great success, leading his team to the conquest of the Vanier Cup in 2003, 2004, 2006, 2008, 2010, 2012 and 2013. Since 2001, Glen has an impressive record of 105 wins and 18 losses in the regular season and 39-9 in postseason play. The 2015 RSEQ Dunsmore Cup will be played tomorrow at Stade TELUS – Université Laval at 2 p.m. 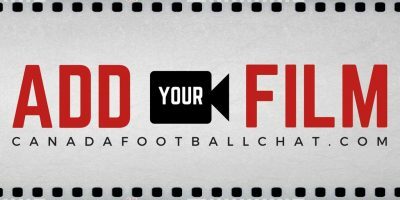 The game will feature perennial rivals Montreal Carabins and Laval Rouge et Or and will be broadcast live on TVA Sports. The RSEQ is committed to the promotion and development of sport and physical activity in an educational setting from the grassroots level through to high performance sport. The RSEQ prioritizes education and academic success as well as the health and well-being of young people.